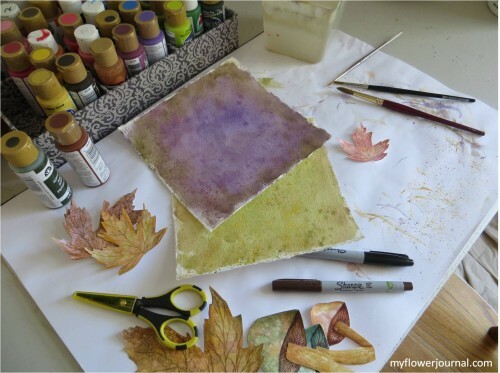 I love to create art and try new craft ideas, but I don’t like a mess! Over time I have learned some things that make the clean up easier for my projects. It’s easier for me to start a new project when I know the clean up process won’t be overwhelming. 1. Always wear an apron! Wear an apron even if you think you are only going to paint for a few minutes. If your like me a few minutes turns into an hour and I usually get messier than I think I will! 2. Keep baby wipes or Clorox wipes or any kind of wipes nearby. They are great for wiping paint off your hands, stamps or anything else you might get paint on. I also like to have a roll of paper towel where I can reach it. 3. 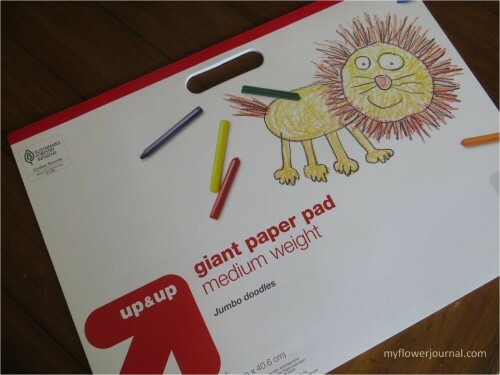 I always have a child’s drawing pad (22″x16″) on my art table or kitchen table when I am doing any kind painting or craft project. It protects the surface I am working on and it is great to have a place to test colors or do scribbles. If I don’t want to work at my art table I can pile whatever I am doing onto the pad and carry it into the kitchen or outside or wherever I want to be. When the paper starts to get too messy to work on (or when I’m through with a project) I tear the top page off and throw it away leaving a nice clean sheet to work on. With 30 sheets in each pad it lasts quite a while. You can get them at Walmart or Target and they only cost about $5.00. 4. Splattering Paint can be a messy project! I finally found a good solution. I bought a presentation board at Hobby Lobby for $3.99. (The kind you use for science fair projects.) I cut it in half and put it around my art pad when I’m splattering paint. It catches the splatters I can’t control. Cutting it in half gives me two, but more importantly it doesn’t tip over as easy. When I’m not using it I can store it flat. 5. Buy cheap plastic tablecloths from the dollar store for big projects when you want the whole table covered. When your done fold the messy part to the inside and throw it away. 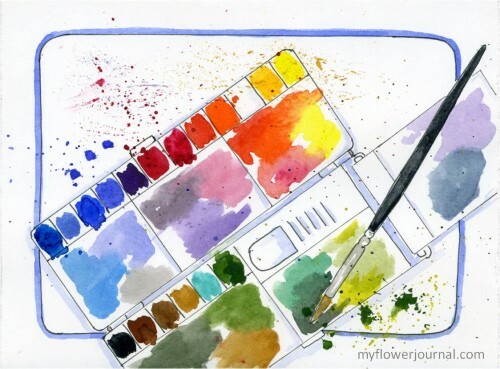 Art Journal Page: A messy watercolor palette can be beautiful! Love these ideas–I need the reminder for grandchildren. I forgot how messy kids are! 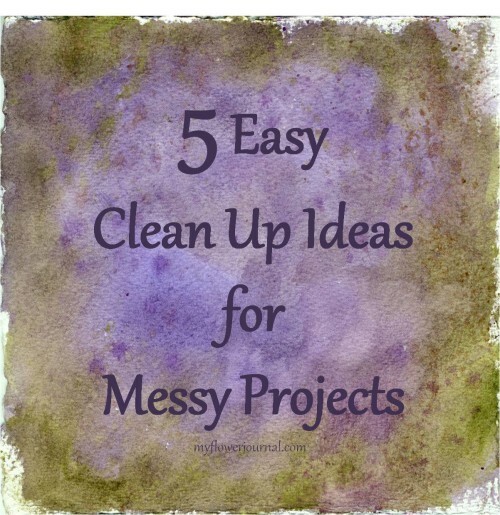 Tammy, these are some great tips because I am very messy when I craft or paint! I especially like your tip about the vinyl tablecloths-so much easier than newspapers! These are wonderful tips…thanks so much for the ideas! Love your ideas, some of them I already use, but some were new to me. Your backgrounds and your painted palette are so pretty. Thank you! These are great ideas! 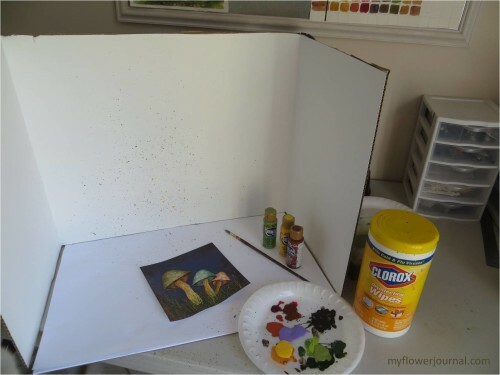 Wonderful advice… love the splatter board idea!! Very nice artwork too!! You are totally brilliant! Thank you so much! I love the splatter idea with the presentation board. I am going to get one this week. Also a great idea to photograph perhaps! HPPF!! !